3,Do not use this adaptor with appliance that exceeds 80W. 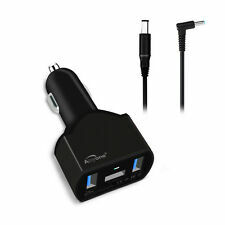 Plug the auto power adapter into the cigarette lighter and the connector in the laptop for charging while you are travelling in the car, boat ect. You can find this information on the labelof your original adapter. Compare the DC Pin of your adapter with the pins available with our adapter. Universal Easy To Use. 10-15V DC 8A. High Quality UK Approved(Tested in UK). 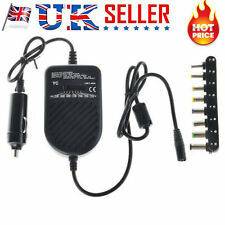 DescriptionsUniversal Laptop Charger DC Adapter : Power your laptop from your Car, Boat or MotorhomeImage result for 80w car laptop chargerSimply plug the 12v adapter into the cigarette lighter and plug the connector of your choice into your laptop for charging on the go!The size of eight tips are6.4mm*4.0mm (with pin)6.3mm*3.0mm 5.5mm*2.5mm 5.5mm*2.1mm 5.5mm*1.7mm 4.8mm*1.7mm 4.0mm*1.7mm 3.5mm*1.35mmFeaturesThis high power DC adaptor is designed to power the popular brand notebook computers which require DC input from 15V to 24V The integrated fuse protects your equipment from potential power surges, short circuits and overloadsProtected stabilized output for low interferenceFuse for overload protection (10 AMP)8 interchan. 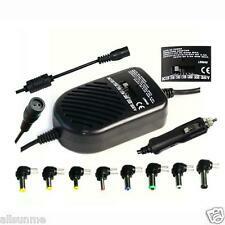 Suitable for use with cars, boats and trucks with 12v power socket. Input 14V DC 8Amp Max. 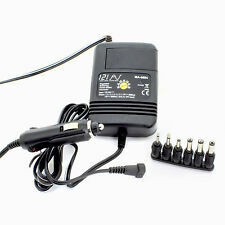 Output 15V, 16V, 18V, 19V and 20V DC 4Amp. 22V and 24V DC 3.3Amp. High power: 80W MAX. 1 x Power Adapter. Adjustable gear: DC 15 16 18 19 20 22 24V. 15/16/18/19/20V DC 4A. 22/24V DC 3.3A. 1 x 8 Ports Adapter. Due to the difference between different monitors, the picture may not reflect the actual color of the item. Welcome to my shop , the following is specific information of the goods in this listing. ***************************GRADE A ************************ ***************************GRADE A ************************ ***************************GRADE A ************************ Features: Universal laptop charger for use at home and in the car Extra USB port for charging a second device Overheat protection, overload protection, short circuit protection Comes with 8 separate power plugs to fit different kinds of laptops. 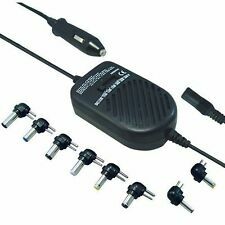 All-in-One Universal Laptop Adapter Used to Supply Power and to Charge Thousands of Laptop Models. This Adaptor Can Deliver - Any Voltage between 15V and 18V up to 4.06A (Must have switch on Green) Any Voltage between 18V and 21V up to 3.33A (Must have switch on Blue) It also has a USB Port which can deliver 5V 1A You can Plug the Power Supply into Any Country Wall Socket from 100V to 240V (perfect for UK, EU, USA etc) You can also use the Car Socket Adaptor to plug into any 12V -15V Cigarette Port and then into the Power Supply (when out and about) It will turn the 12V comming out of the Car Port into the Voltage that your Laptop / Device needs to Charge. You have a choice of 9 push on tips which are sizes - 4mm x 1.7mm 4.75 x 1.75mm 5.5mm x 1.75mm 5.5mm x. Output power: 80W. Always turn off the computer before you connect disconnect the car adaptor. Stabilized output,low ripple & low interference. Output current: DC15/16/18/19/20V/22/24V 3.3A. There might be a bit color distortions due to different computer resolutions. Do not use this adaptor with appliance that exceeds 80W. Output: DC 15/16/18/19/20V 4A max; DC 22/24V 3.3A 80W max. Always turn off the computer before you connect disconnect the car adaptor. Remove from vehicle lighter socket when not in use. Output Power: 80W. This high power DC adaptor is designed to power notebook computers which require DC input from 15V to 24V. For SONY Picturebook. For SONY VIAO. Suitable for the following models. 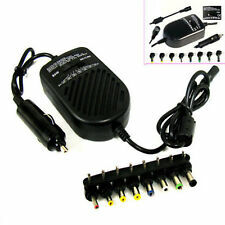 Features Universal power adapter to provide power for your laptop, notebook, computer requiring DC input of 15V to 24V from your car, boat or motorhome and so on, widely compatible. Easy to install and use, just plug the 12V adapter into the cigarette lighter and plug the connector of your choice into your laptop for charging on the go. Eight interchangeable tips in varied sizes are available for flexible adaptability to different notebook models. Integrated fuse protects your equipment from potential power surges, short circuits and overloads. This product does NOT suit for Dell, HP. 1 Plug Adapter. Easy to use, just plug into the cigarette plug port of your car. Note: The real color of the item may be slightly different from the pictures shown on website caused by many factors such as brightness of your monitor and light brightness. Continuous Output Power Continuous Output Power: 90W. 1pc AC/DC Adaptor Body. 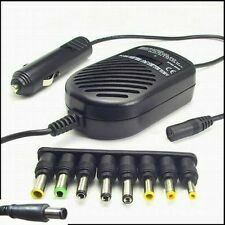 8 different size detachable plugs, Works with Most Notebook Computers. 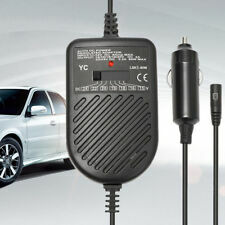 DC Input DC input (car cigarette lighter): DC12V (DC10-14V). 8 interchangeable tips for flexible adaptability to different notebook modelsAdjustable output voltage, satisfy the requirement of different type of laptopsOverload and short circuit protection to protect it from damageHigh efficiency and low energy consumptionPower LED indicatorInput: DC 11-14 Volts.Output: DC15/16/18/19/20V DC 4A.DC 22/24V 3.3A 80W max.Fuse for overload protection (10AMP) Operating instruction:A.Voltage selection:1. Proper output voltage setting. Please check the voltage indication marked next to the input jack on your laptop. You may find the voltage in your AC adaptor or in the computer user's manual.2. Set the voltage switch on the body of the adaptor into the corresponding voltage of your laptop. Please remember to press the voltage sw.
Output: DC 15/16/18/19/20V, 4A Max. ; DC 22/24V, 3.3A 80W Max. It is really a wonderful auto accessory for choice. - Suitable for almost all laptop and Notebook computers. - High efficiency & low energy comsumption. Output Power: 80W. This high power DC adaptor is designed to power notebook computers which require DC input from 15V to 24V. Fuse for overload protection (10 AMP). Note: The real color of the item may be slightly different from the pictures shown on website caused by many factors such as brightness of your monitor and light brightness. (2)Power: 90W. 19V (90W Max). 16V (90W Max). 18.5V (90W Max). for Lenovo IBM. 19.5V (90W Max). 5)Insulation resistance: DC 500V 100MΩ (minimum). 4)Short-circuit protection: automatic recovery. 1 Plug Adapter. Easy to use, just plug into the cigarette plug port of your car. Note: The real color of the item may be slightly different from the pictures shown on website caused by many factors such as brightness of your monitor and light brightness. Features: 6 protection functions: over-current, overload, high voltage, high temperature, short circuit, and undervoltage.It will not cause damage to external devices and the vehicle itself.It will not cause the vehicle to fail to start due to forgetting to close the device.Built-in electronics fuse is more secure and reliable.Using microcomputer chip control technology, conversion rate more than 90%.Real-time microcomputer automatic adjustment and&nb. Output Power: 100W. Allows users to use computer notebook laptop in car for long hours without running out of batteries. DC Output: DC 12-24V DC4A USB5V. USB Port: 5V. USB Port maximizes convenience. DC Input: 9V-15V. Simply connect your laptop to your cigarette lighter socket using this power adaptor and you are all set. Insert adaptor into vehicle lighter socket. 2X(Perfect for in-car use for your notebook/laptop, no more running out of batteries. ). Insert adaptor into vehicle lighter socket. Green LED will light to indicate proper operation. Perfect for in-car use for your notebook laptop, no more running out of batteries. Power LED indicator. Input: DC 11-14 Volts. Simply connect your laptop to your cigarette lighter socket using this power adaptor and you are all set. 3X(Perfect for in-car use for your notebook/laptop, no more running out of batteries. Insert adaptor into vehicle lighter socket. ). Works with Most Notebook / Laptop Computers. Support most of the Notebook for Acer, Dell, Compaq, IBM, NEC, Sony, Fujitsu, Gateway, HP, Sharp, Toshiba and etc. (With circle plug). LED Indicator. Output at 15 - 24V DC. Insert adaptor into vehicle lighter socket. Green LED will light to indicate proper operation. Perfect for in-car use for your notebook laptop, no more running out of batteries. Power LED indicator. Insert connector output plug into your laptop. Simply connect your laptop to your cigarette lighter socket using this power adaptor and you are all set. Insert adaptor into vehicle lighter socket. Power LED indicator. High efficiency and low energy consumption. 5X(Perfect for in-car use for your notebook/laptop, no more running out of batteries. Simply connect your laptop to your cigarette lighter socket using this power adaptor and you are all set. Insert adaptor into vehicle lighter socket. ).